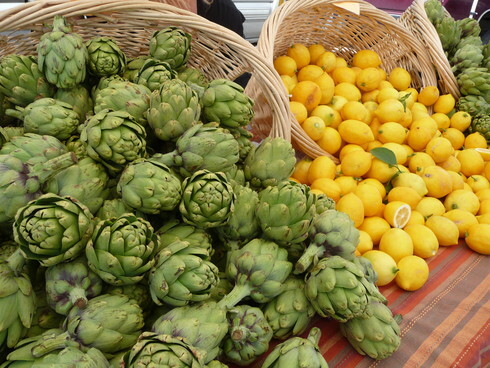 Artichokes and Meyer lemons are a great pairing. And I love them both roasted. I first had a similar dish at Cindy’s Backstreet Kitchen in St. Helena, California. I went home, picked some Meyer lemons from my tree and started experimenting. I have been making this dish ever since! Prepare the artichoke by trimming the stem down to about an inch and removing the small outer leaves at the bottom. Cut the tops of the leaves off so that there are no prickly thorns to surprise anyone. 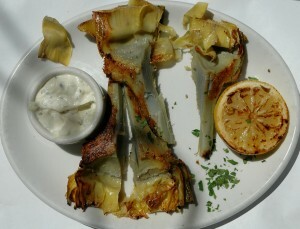 Cut the artichoke into quarters and remove the choke (the fibrous area in the center) from the each quarter. Meanwhile, fill a large pot with the water, the wine, two of the Meyer lemon halves, the bay leaf, the peppercorns and 1 teaspoon of sea salt. Bring to a boil. 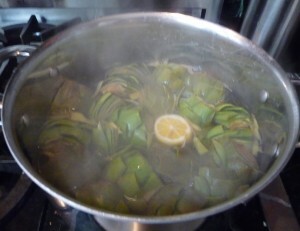 Add the artichoke quarters and bring back to a boil. Reduce the heat to medium and cook for about 10 minutes until the artichokes are just starting to get tender throughout. Remove from the heat. 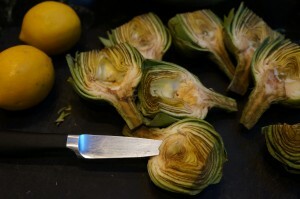 Remove the artichokes from the liquid with a slotted spoon and put them into a large baking dish. 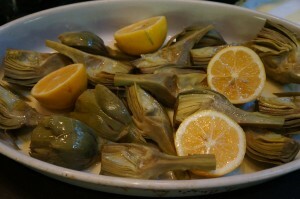 Drizzle the artichokes with olive oil, rubbing each one to make sure that it is coated with the oil. Rub the remaining 4 lemon halves with olive oil and place them, cut side up, in the baking dish, as well. 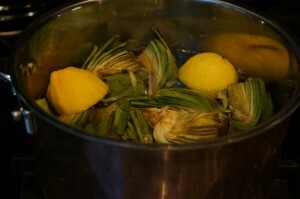 Roast at 425 degrees Fahrenheit for about 30 minutes,or until the artichokes and the lemon halves are browned. Remove from the heat. Sprinkle with fleur de sel (sea salt). 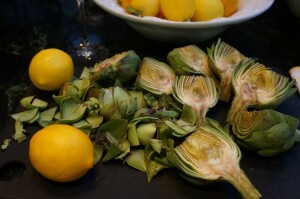 Serve the artichokes along with the roasted lemons. 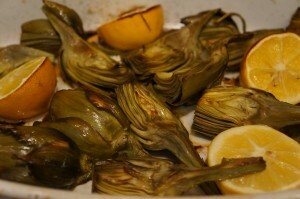 Squeeze the roasted lemon juice over the artichokes for a real treat. You can, of course, also serve this dish with your favorite aioli, mayonnaise or yogurt dipping sauce.